Created for Shiseido by Serge Lutens, Christopher Sheldrake and Pierre Bourdon in 1992, Féminité du Bois revived the interest in woody notes in women's perfumes and launched a thousand other woody-oriental fragrances, including Les Eaux Boisées from Serge Lutens’s Les Salons du Palais Royal collection*. Féminité du Bois is centered around a cedarwood note that stays present from the top to the base notes. Combined with the dark fruitiness of peach and plum, the sweetness of honey, the ripeness of roses, the spiciness of cinnamon and clove, and the smoothness of sandalwood, cedar shows its feminine, warm, extremely sensual side. Like Bois des Iles, this is one of those scents in which I feel most “at home”, and I suppose in a way it is a comfort scent for me. Having said that, Féminité du Bois is not soft and cuddly. It is a hearty scent, darkly sweet and robust. 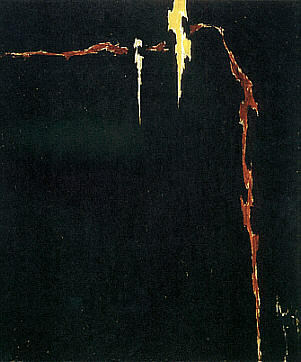 It makes me think of Painting, 1944 by Clyfford Still, with its black vastness slashed by a serrated red line. Féminité du Bois has the same abstract forcefulness; like the colors in Painting, the notes here are applied “thickly”, like slabs of paint thrown at the canvas with a palette knife. I can only describe Féminité du Bois as “exquisitely robust”; generous and full-bodied as it is, the fragrance is incredibly well blended, and is one of the most sophisticated scents that I know. Féminité du Bois is available in a variety of forms, including Parfum, Eau de Parfum, Eau Timide (a more delicate version of the scent which “softens your skin with water-fresh moisture”, a good option if you find the regular version a little too intense), Parfum Stylo, Too Heavenly Body Cream (indeed a heavenly treat, moisturizing and very true to the scent, I would recommend to all the fans of Féminité, if you can find it), Mist Emulsion Body Veil, and Deodorant Body Spray…And now the bad news…As far as I understand, Shiseido does not export Féminité du Bois to the US, consequently, it is rather hard to find. Right now it seems to be available at Perfumemart.com, $90.00 for 1.6oz of Eau de Parfum. It also sometimes pops up on eBay, but is never cheap even there. *Apart from Les Eaux Boisées (Bois et Fruits, Bois et Musc, Bois Oriental, Bois de Violette), among other scents undoubtedly inspired by Féminité du Bois are Miller & Bertaux Eau de Parfum # 1 For You, Guerlain Aromaparfum Exaltant, and Delrae Bois de Paradis. 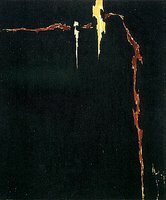 **The painting is Painting, 1944 by Clyfford Still, Museum of Modern Art, New York. The Féminité du Bois ad is from shiseido.co.jp. "Darkly sweet and robust" is exactly right, and it is why I don't really like it. If they had toned down the sugar just a bit, I would adore it. I sort of had a feeling you might not like it, R. What about Bois et Fruits? On me, it is drier and less intense than F du B. Or Miller et Bertaux # 1. That one is even drier. Thank you for this nice description of a perfume I do not know. Do you happen to know whether it is Texan cedarwood or the Atlas Cedarwood? "Born of the profound harmony and balance found in nature, Féminité du Bois is a tribute to perfection, beauty and pure, sensual feminity. Inspiration begins with the satiny-warm essence of the Cedarwood Atlas tree. Then floral, fruity notes and hints of spice are added to create perfect balance." I love that dark essence of it, the one you described as robust. It is indeed, yet it manages to retain clarity (it is not dense). Lovely tribute to one of my beloved fragrances. To answer Andy's question, Iso E Super is used here at the 45% concentration, which is what gives the composition that woody radiance. Thank you V. It is indeed dark/heavy and clear at the same time. Thank you C. and B. Thank you for your lovely review of one of my favourite perfumes. To Andy I'd like to say that I think there's quite a few synthetics involved in the atlas cedar accord in FdB. I think Lutens once said that he wanted to capture the impression of atlas cedar, not the scent itself(whatever that means). FdB is wonderfully rich, both sweet and dry and somehow airy and crystalline. In my opinion it's one of the best releases of the last twenty years. What a great description of F du B, and I totally agree, it is one of the best modern perfumes. hehehe... what ever this means. Right you are! Someone regifted to me a bottle of Feminite du Bois when I was living in Paris as a student in 1993. The scent was so precious and alluding to me that I saved and used the first bottle for 5 years. It is a highly-specific scent...rich for Fall and Winter. I absolutely adore this scent too, and never want to be without a bottle of Feminite. I just love this scent and have been a proud owner of the EdP for about a year now. Yesterday when I went into my favorite fragrance store in the town where I live (they have a very ordinary selection, but their service is the best!) I noticed some Shiseido stuff being on sale at 50% the original price. I asked the lady in the store about them and she let me know that she would put them away for me (I bought Mitsouko at the time and she gave me a mini flacon of Diorissimo to me as a gift). The bundle consisted of one Parfum Stylo with four cartridges in total. When I went in there to pick the rest up today I noticed she also held the Mist Emulsion Body Veil in her hands and I let her know I wasn't interested in that one. She added it as a gift to me she said and let me get everything for $28. Amazing I must say. Now it is time to test the perfume, I've never seen anyone comment on it before! I have the beautiful rollerball stylo pen but no spare cartridges, I miss this perfume badly! Would love to track down a spare cartridge, don't know where to look - am in the UK - failing that I would take offers on the pen! I am anxiously awaiting my bottle of Shisiedo Feminite Du Bois....I bought it unsniffed!! It wasn't cheap on ebay.....but I wanted it! I am so hoping I love it! !